The Rue de Lyon collection is well crafted with quality maple solids, select hardwood detailing, and American cherry veneers, finished in a rich chocolate patina. Desk pedastal has a felt lined box darwer with a pencil tray and a tower computer cabinet. 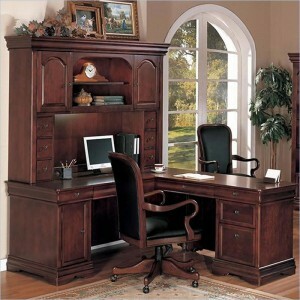 Both the desk and return have a center drop front drawer that can function as a pencil drawer or a keyboard drawer. Return pedastal includes a felt lined box drawer and a pencil tray, box drawer with dividers, and a file drawer.